Hyderabad: This year too, the MSians performed brilliantly in the SSC examination and continued the legacy of their seniors by scoring perfect 10/10 GPA. 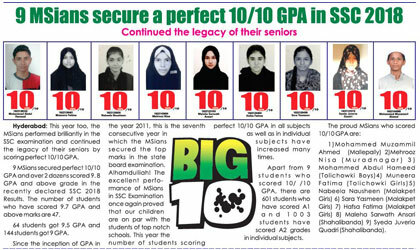 9 MSians secured perfect 10/10 GPA and over 2 dozens scored 9. 8 GPA and above grade in the recently declared SSC 2018 Results. The number of students who have scored 9.7 GPA and above marks are 47. 64 students got 9.5 GPA and 144 students got 9 GPA. Since the inception of GPA in the year 2011, this is the seventh consecutive year in which the MSians secured the top marks in the state board examination. Alhamdulliah! The excellent perfo-rmance of MSians in SSC Examination once again proved that our children are on par with the students of top notch schools. This year the number of students scoring perfect 10/10 GPA in all subjects as well as in individual subjects have increased many times. Apart from 9 students who scored 10/ /10 GPA, there are 601 students who have scored A1 and 1003 students have scored A2 grades in individual subjects. 9) Syeda Juveria Quadri (Shahalibanda).